Ever heard people talking about the Disney Dining Plans and wondered what they were, what they include, or whether or not they are worth it? Disney Dining Plans are offered at both parks, Walt Disney World in Florida, and Disneyland in California. Even though both parks offer a dining plan, the two work very differently, and come with their own unique advantages and disadvantages, and deciding if you should add a dining plan to your package depends on a number of things. Some things to talk about with your travel agent include which park you are going to, what kind of dining you are planning on doing, how you like to budget for your vacation, among a number of other things that will be broken down throughout this blog series on the Disney Dining Plans. So now that we have started thinking about the Disney Dining plans, let us take a closer look at the Walt Disney World Dining plan. Though Disney World is a much larger park, I find that the dining plan here is much easier to understand and to make a decision on then the dining plan in California. For the Florida dining plan, we are going to look at customization, pricing, disadvantages and advantages. The dining plan in Florida in my opinion is a little less customizable. When you decide you want to add a dining plan to your Magic Your Way package you are deciding to have the dining plan for each night of your stay, this is important to keep in mind and consider. Say you are flying in early in the morning and flying out late in the day 6 nights later, you would then have 6 days of dining plan and 7 days in the park, so you have to remember to budget for that one days meals. On the other side of that consider the possibility that you are staying at Disney for 8 nights but spending 2 days at Universal and 6 days at Disney, you would have 8 days of dining to use in 6 days at the park, there are ways to use all of your dining experiences but it is important to plan for this. The customizations that are available for the dining package is what level of dining package you want. Disney World has 3 different levels of dining packages, Quick Service, Full Service, and Deluxe Dining. The quick service-dining plan includes 2 quick service meals, 1 snack per person per night of stay and 1 resort refillable mug per person for length of stay. The Full service-dining plan includes 1 full service meal, 1 quick service meal per person per night of stay and 1 resort refillable mug per person for length of stay. The deluxe dining plan includes 3 meals and 2 snacks per person per night of stay and 1 resort refillable mug per person for length of stay. So now, what is each of these? A snack can be anything from the ice cream novelties, individual sized popcorn, a bottled beverage or 22oz fountain drink, most things that are sold at the carts throughout the parks and can be eaten while strolling through the park or in line. A quick service meal is anything from those more fast food type restaurants, both in the hotels and in the parks. For breakfast, it includes 1 entrée or 1 combo meal and 1 drink. This could be a waffle and chocolate milk at the hotel before hitting the parks, or for lunch and dinner, it includes 1 entrée or 1 combo meal, 1 dessert and 1 drink, so this could be burger and fries with a soda and a cookie for dessert in the park for lunch, or a number of other options. And a full service meal is a meal at the sit down restaurants, it includes either 1 full buffet or 1 appetizer, 1 entrée, 1 dessert and 1 drink per person for lunch and dinner or 1 entrée and 1 drink per person for breakfast (no alcoholic beverages are included with any of the dining plan options. The resort refillable mug is a travel mug that is designed to hold hot or cold drinks that can be refilled free of charge at the hotel quick service restaurant for the entire length of stay. We will look at some meal options at the end. So, now that we know what the dining plan includes, the next thing to consider is what does it cost? This also depends on a number of things, which dining plan option you choose, the length of your trip, and the time of you are traveling all contribute to the cost per day of the dining plan. In the last couple of years, Disneyworld has offered a number of different specials for booking vacation packages that include dining, this could be anything from a selected dollar amount off your entire vacation package, to free dining included with the purchase of a package. Let us look at an example of comparing the price, for this Christmas to book a 6-night 7-day package for 2 adults staying at the Caribbean Beach Resort with a base ticket for all 7 days (December 24-30, 2013). For pricing, it is important to remember that if your dates are flexible there may be special offers around the same travel dates, and a travel agent may be able to help you pick travel dates with these special offers or may know what times of year tend to have special offers offered. 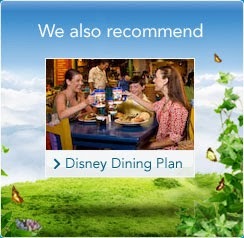 With the Disney World dining plan, I do not find that there are many disadvantages to purchasing it. It does require that payment for food is completed upon your vacation package payment deadline, dining options are more set with a dining package then without, and as noted above the number of nights you are staying may not match up with the number of days in the park. For each of the above disadvantages there is another side. You do have to prepay for your dining plan however, this alleviates the need to budget for food while you are on vacation, and your spending money is truly just spending money. Most of the full service restaurants require a reservation to eat at them, especially at peak times. By purchasing a dining plan, you already know how many sit down meals you are going to have so you do not have to stress about how many reservations you are committing to or what the final bill will come to, you already know all of that. If you are staying for say, a 6 night 7 day package you only have 6 days’ worth of dining pre-paid for, but this means that for the equivalent of 1 day you can eat at places that do not accept the dining plan, though most restaurants on property do accept the dining plan there are exceptions each year. On the flip side if you have more than enough dining included for your trip, say you are visiting other attractions of property for some of your days, there are ways you can still use all of your meal allotments. You can have breakfast at your resort before going off property, or a late night pizza at your room when you can get back. There are also some dining experiences that use two full service dining allotments for one meal, Cinderella’s Royal Table, so on one day if you want a reservation here you could use two full service allotments. Eating off property at Disney World during days that you are in the park is difficult to say the least, if you are staying on property, and spending the day on property you will most likely also be eating on property, either at the park, or at the hotel. This leads to what is possibly the biggest advantage, and biggest deciding factor, is though it may seem like a large extra expense upfront to begin with purchasing a dining plan, and especially the right dining plan for you could save a lot of money in the long run. Check back for more information on Disney Dining Plans: Part 2- Disneyland.